A camera shows SpaceX's Starman mannequin and Elon Musk's Tesla Roadster as they fly above a ROUND Earth after launching on the first Falcon Heavy rocket test flight on Feb. 6, 2018. 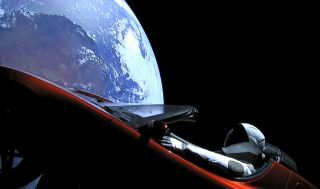 Yesterday's successful launch of SpaceX's Falcon Heavy rocket also sent an unusual payload into space: a cherry-red Tesla Roadster "manned" by a dummy named Starman and equipped with cameras that provided gorgeous views of Earth against the backdrop of space. But flat-Earthers aren't buying it. "People who believe that the Earth is a globe because 'they saw a car in space on the Internet' must be the new incarnation of 'It's true, I saw it on TV!' It's a poor argument," tweeted The Flat Earth Society, an organization dedicated to spreading the (incorrect) notion that the Earth is not round. "Why would we believe any privately held company to report the truth?" the organization added. Flat-Earth conspiracy theorists have a long history of mistrusting the government when it comes to space. On forums devoted to the belief that the Earth is a flat disk, "NASA" often gets mocked as standing for "Never A Straight Answer," and astronauts' attempts to answer the common flat-Earth call of "show me the curve" are regularly dismissed as hoaxes and lies. Now, Elon Musk's private spaceflight company has apparently joined the ranks of the hoaxers and liars, the flat-Earthers say. On Twitter, flat-Earth accounts posted about "FakeX" and insisted that photos of Starman against a round Earth were Photoshopped. On Starman's live YouTube feed, chatters trolled one another with taunts about how the video proved flat-Earthers wrong, or was part of a vast conspiracy, depending on who was doing the trolling — flat-Earth opponents or believers. In the thread following The Flat Earth Society's tweet, the person in charge of the feed referred most challengers to the organization's Wiki page, where members posit that the planet is a flat disk with the North Pole at the center and an ice wall (what most people know as Antarctica) skirting the edge. It's impossible to say how many people actually believe that the Earth is flat — especially online, where trolls and true believers are difficult to distinguish. The Flat Earth Society lists 555 members, and the organizer of a flat-Earth conference that took place in November 2017 in North Carolina told Live Science that about 500 people attended. Experts in conspiracy belief say that, despite their strange insistence on ignoring more than 2,000 years of scientific observation, flat-Earth theorists may be fairly similar to believers in other conspiracies: They tend to be drawn to these beliefs out of the sense of control and special knowledge they confer, and the believers tend to like black-and-white versions of the world in which clear "bad guys" try to pull the wool over the eyes of the "good guys." Some flat-Earth believers are motivated by their interpretations of the Bible as saying the Earth is flat. (The organizer of November's flat-Earth conference is a Christian creationist.) Others simply don't trust anything they can't see with their own eyes. There's a name for this, the Zetetic method,which holds personal sensory experiences above all other forms of information gathering. Starting from this mindset, nothing NASA or Musk releases can be considered trustworthy; only going into space to find the curve with one's own eyes counts. Unfortunately, that's not so easy to pull off.